Play With Emotion And Smooth Out Your Legato. How To Practice Left Hand's Jump. Practice For 32nd Notes "Staccato" Or "Rhythm Exercise". If you cannot read music, I recommend using sheet music with letters ! 1. Play With Emotion And Smooth Out Your Legato. When playing (ED#ED#EBDCA), you can play soft and slow at first. Then feel expanding of the phrase. The end of phrase going to be soft. When using No.1 finger, please be careful. It will be easy to be noisy. Especially pay attention when playing the end of the (A). When also playing (CEAB-)(EG#BC-), if you feel the phrase of ups and downs, you will be able to express the melody better. If you want to play more high quality legato (If it is possible…), Listen to the sound that you play currently and next. you should have a moment when you hear both. 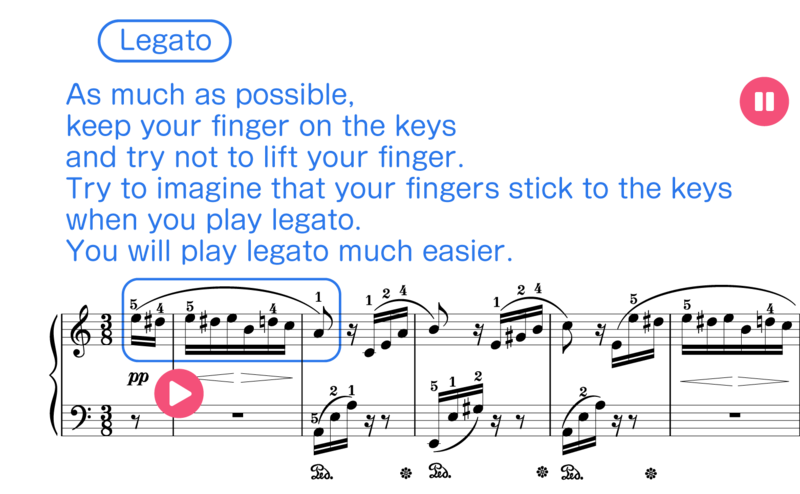 When playing legato, try not to raise your fingers as much as possible and keep your fingers on the keys. Prepare The Left Hand Octave Position ! When playing (AEA),if you prepare the octave's hand position, it will be easy to play. Remember to keep a good hand position and control your sounds softly. 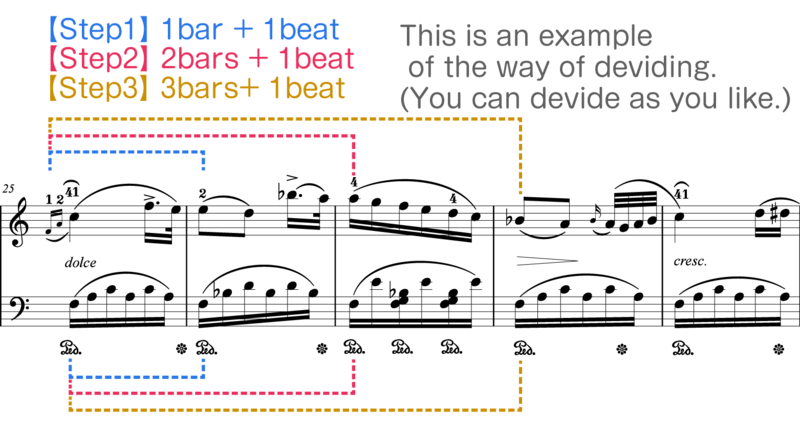 When playing (EEG#), EE is the octave. But, when playing G#, cross over your thumb with your index finger. Tip: Practice a slow tempo that you can play well and remember how far you need to move your fingers. For a while, a brighter melody shows up. 3. How To Practice Left Hand's Jump. When you jump your hand, lift your elbow joint left to right. so you will master it if you practice. At first, you can start to practice slowly then adjust the speed so that you can play the keys well. However, if you practice the technique of jumping your hand, it is very beneficial for you in the long run. So, you should try! This part is a little bit difficult because chords change delicately. Follow the below 1~3 steps to practice. It is not so difficult. Pay attention to the posture of your hand, practice slowly and correctly. It's really important to practice minimum phrase with both hands. For beginners, it's difficult to play well with both hands even if he could play well with each hand. Playing both hands is completely different from playing one hand. So try this practice slowly many times. When you play the grace notes in the piece of Beethoven's period, play the first note of them on the beat. If it's difficult for you, for starters, play the grace notes before the beat. Singing the notes while playing is very effective for your practice. If you can't play the left-hand part, you need muscle training a littel bit. If you feel "Staccato Excercise" easy, feel free to stop exercise. In my opinion, it makes effect in a week. Let's try! 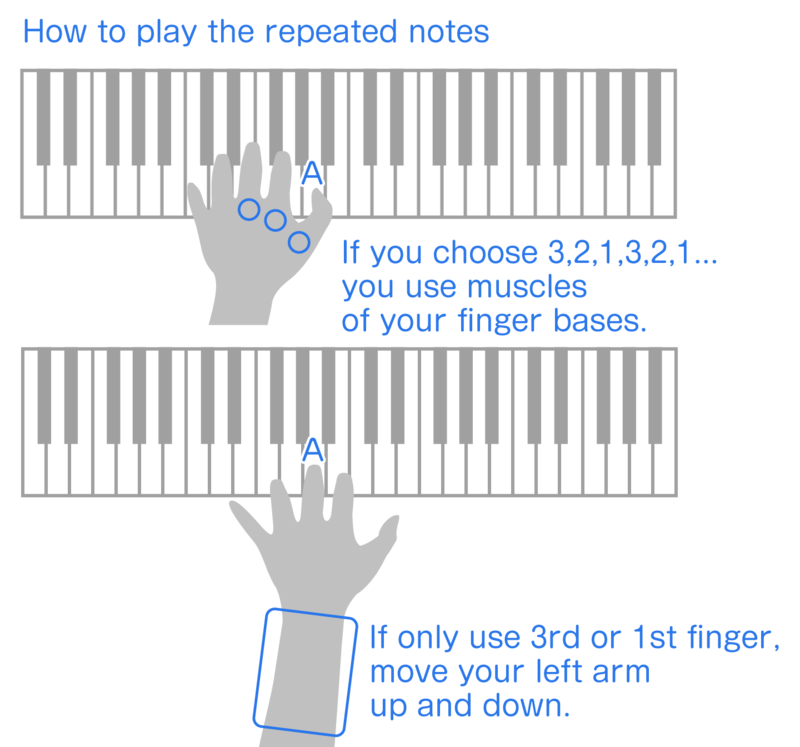 You will be able to change the hand posture smoothly on the moment of the chord changes. How the posture of your left hand changes? This practice is helpful keeping the tempo of your right hand. Voice is easier to control so you can get feeling like both hands in the correct tempo. But when you feel this more difficult than both hands practice, you don't need to do it. but you should practice little by little and correctly! 3. 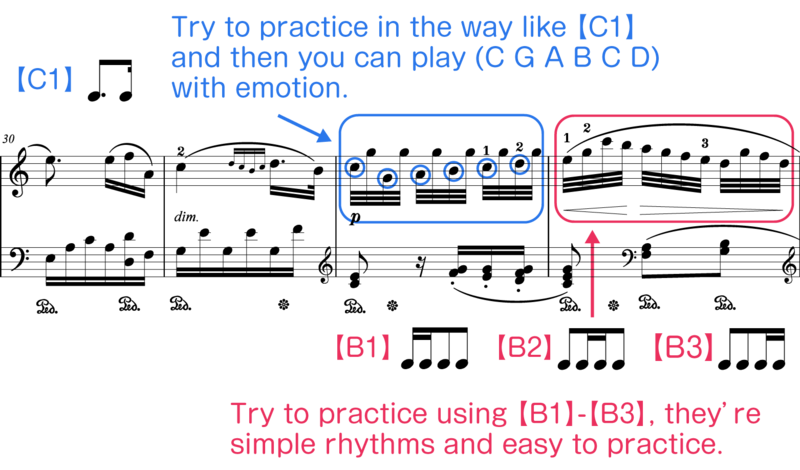 Practice For 32nd Notes "Staccato" Or "Rhythm Exercise". Here is the most difficult part of this piece. It is good to practice in staccato or different rhythms because it requires finger muscles. In left-hand part, (3,2,1) is usually used. But in the case of slow repeated notes like this, you can use (3,3,3) or (1,1,1). Because using the different fingeres on the same key makes it hard to control dymamics and rhythm. Pressing the same key fast may force you to press the key that has not yet risen up. And during the changing fingers, it is hard to recognize a position of the key, that is rising up or have already risen up. As a result, it tends to be difficult to press the key well. But using the same finger is not suitable for fast repeated notes. If your teacher recommends (3,2,1), he supposes that you will play fast repeated notes in the future. Because of the same key in the left-hand part, vertical additional lines help you see the score easily. About the minimum phrase practice. check this page. Though it'll be a bit more difficult, be careful not to accent on the note (A) when you change the fingers. You can choose the 2 ways: "Thumb under" and "Jumping" for this phrase. "Thumb under" is suitable for a near key, and "Jumping" for a far key. 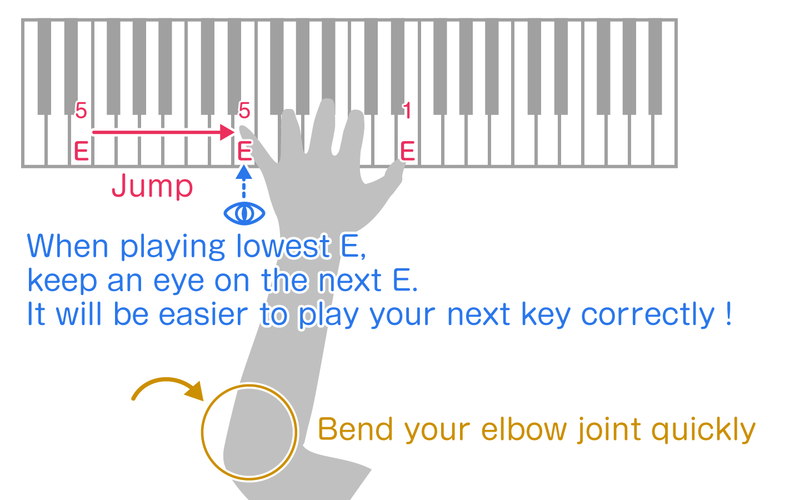 The distance of (ACE)(A) is not so far, so many pianists use "Thum under", but you can use "Jumping", also. 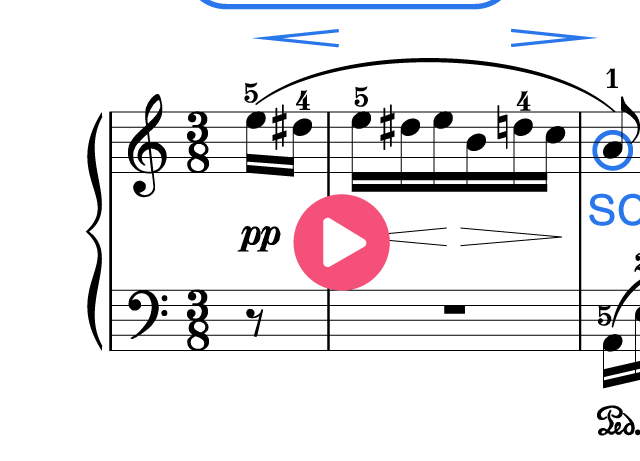 Pros And Cons Of "Thumb under"
You might make an unnecessary accent because of your wrist's up and down motion of "thumb under"
Pros and Cons of "Jumping"
You can easily control the keys (ACE) before jumping, because you can keep the angle to the keyboard. About practice of "Jumping", please check this out. 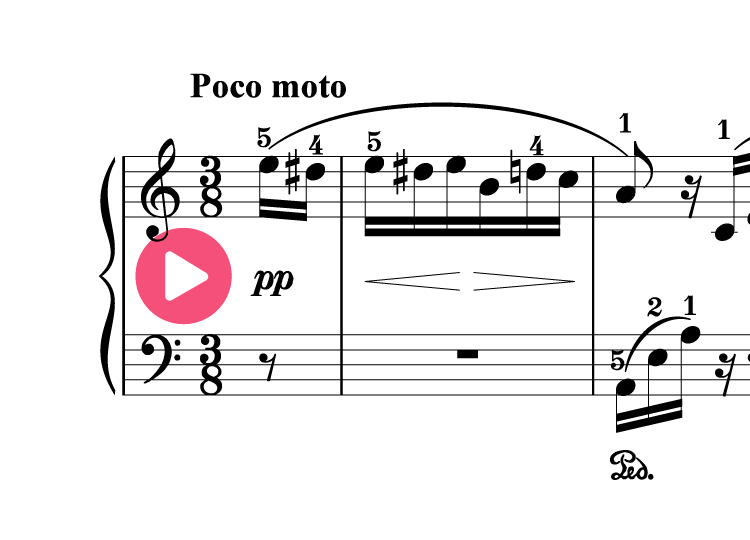 You should keep the tempo when the theme (ED#EBDCA) is back after the chromatic scale. Crap your hand on the beat, sing (B♭AG#, GF#F, ED#D, C#CB, B♭AG#, GF#F, ED#, EB, DC, A), and you can get the feel of 3/8 time. I don't mean you should accent the notes on the beat. Try to feel the beat in your mind. We explain so that you can understand easily.